Nextion Display : Nextion 2.4"
DVMEGA AMBE3000 shield fits on top of an Arduino MEGA. This board is equiped with a AMBE3000Vocoder and PCM3500 Codec. The PCM3500 converts the analog microphone signal into a digitalstream (PCM). And that, conversely, the digital PCM stream is converted back into an analog audio signal. The digital PCM format is 8Khz with a depth of 16 bits. This would be an amount of data of128000 bits per second. Not suitable to be sent via a 4800 bps radio connection. The AMBE3000Vocoder makes of 128000 bps a digital signal of 3600 bps. This is the voice information and errorcorrection codes. These error correction codes make it possible to restore a signal which arrives corrupted at the receiver station up to a certain level. 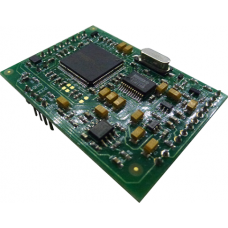 DVMEGA AMBE3000 can be used as AMBE Dongle (Digital Voice converter) but also as a digital transceiver in combination with the Dual band radio shield or GMSK shield. 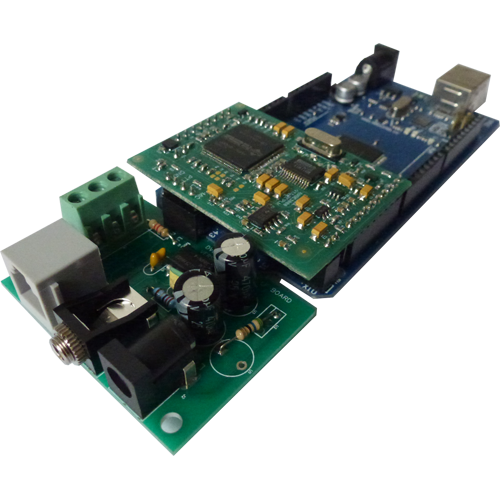 The DVMEGA AMBE3000 shield will be delivered in conjunction with a LF amplifier / connection board. This board is equipped with a 0.3 watt LF amplifier and connectors for Mike, Speaker and power. Later, this module can be placed on the transceiver mainboard. Compatible microphones are MH48 (Yaesu) type. Step 3, Load the firmware. Start Xloader, choose the correct hex file, select Device and set the COM port to the port number that is assigned to the ARDUINO . The baud rate defaults to 115200. Then press Upload to load the firmware. If the firmware is loaded correctly a message will appear below in the bar of the Xloader screen . NOTE: the development on the arduino-board for this module has stalled. DVMEGA AMBE3000 hardware is frozen. Firmware for the DV Dongle Radio Hotspot combination is available.